What does everyone think about the Robocop reboot trailer? How bad are the scripts for Marvel's Agents of S.H.I.E.L.D.? What's the name of the next Jurassic Park film? My brother Nigel is guest posting on Alex J. Cavanaugh's blog with a list of the top ten movies adapted from books! Check it out at http://alexjcavanaugh.blogspot.com. I really liked Iron Man 3, but the latest "honest trailer" makes me wonder if I was off-base. Iron Man 3 hits home video on September 24, so I'll re-watch it and see. In the meanwhile, here's the "Honest Trailer" for Iron Man 3 by Screen Junkies. Snarky spoiler warning! The trailer for the Robocop reboot dropped last week and the Internet was full of opinions. Here is a round-up of some of the blogs that shared interesting perspectives. There's a new trailer and plot synopsis for the pilot out for the ABC show Marvel's Agents of S.H.I.E.L.D..
Joss Whedon, the creative genius behind the feature film “Marvel’s The Avengers,” one of the highest grossing films of all time, and of the iconic television series “Buffy The Vampire Slayer,” has co-created“Marvel’s Agents of S.H.I.E.L.D.,” a dynamic, action-packed one-hour drama that brings back Agent Phil Coulson (Clark Gregg) to lead a team of highly skilled agents to investigate extra-normal and super human people and events worldwide. The series premieres Tuesday, September 24 (8:00-9:01 p.m., ET), on the ABC Television Network. In the premiere episode, “Pilot,”it’s just after the battle of New York, and now that the existence of super heroes and aliens has become public knowledge, the world is trying to come to grips with this new reality. Agent Phil Coulson is back in action and has his eye on a mysterious group called the Rising Tide. In order to track this unseen, unknown enemy, he has assembled a small, highly select group of Agents from the worldwide law-enforcement organization known as S.H.I.E.L.D. (Strategic Homeland Intervention Enforcement and Logistics Division). The group’s first assignment together as a team finds them trying to track down an ordinary man who has gained extraordinary powers. Powers that could have devastating consequences. In other Marvel’s Agents of S.H.I.E.L.D. news, there's a rumor that the episode scripts by Joss Whedon are so bad that ABC is demanding major re-writes. Did you know Bill Murray was almost cast as Batman? Hit the link to find out more bizarre "almost casting" moments in Hollywood. 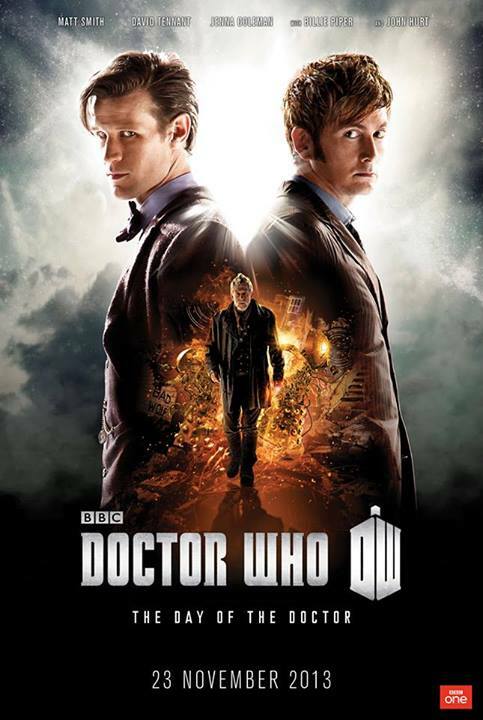 The BBC put out a press release for the 50th Anniversary episode, then quickly pulled it. Of course, the Internet already got a hold of it, so they made it official. 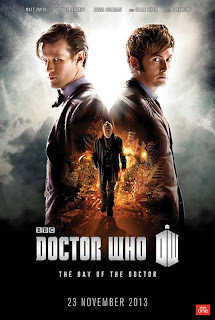 The title "The Day of the Doctor" appears to be a reference to John Hurt at the end of "The Name of the Doctor" who was only named "The Doctor." The special airs Saturday November 23th. The scene where we first meet Batman is terrifying and brilliant. The guys at "Homemade Movies" made it for a fraction of the price and it's awesome. I'm thinking that Leigh may be my new favorite animator. She's produced two new toons that are flat-out hilarious. I already shared her "FanGirls" short and she just released a couple of new ones. First, Fangirls at school described as "Can the fangirls keep their passion alive even through mid-terms?" The second is Peter Capaldi as the foul-mouthed 12th Doctor. If you've ever seen his infamous swearing in the TV show "The Thick of It" then it's hilarious. I'd link to one, but none are even remotely family-friendly. So, if you don't get the joke, then hit YouTube and search for "Malcolm Tucker." After your ears stop bleeding then come back and watch the short. Trust me. This joke is perfect. Roland Emmerich is planning to reboot his classic sci-fi film Stargate (1994). I really enjoyed it, but I'm a sucker of Egyptology. The movie was panned by critics like Roger Ebert who said, "'Stargate' is like a film school exercise. Assignment: Conceive of the weirdest plot you can think of, and reduce it as quickly as possible to action movie cliches. If possible, include sun god Ra, and make sure something gets blowed up real good." While the original film was conceived as a trilogy, it didn't do well but went on to spawn several successful television shows. Now I guess they feel the time is right to start over. I hope the keep the Egyptian stuff. It was hokey, but cool. The sequel to Jurassic Park was scheduled to be released June 13, 2014, but it's been confirmed that the new release date is June 12, 2015. I'm thinking that the title is a reference to dinosaurs spreading across the world instead of just one island. What do you guys think? Check out the sweet packaging for the upcoming Man of Steel Blu-Ray, now available for pre-order. Exclusive Man Of Steel Blu-Ray + Dvd + Ultraviolet Combo Pack And Panoramic Theatrical Poster Bundle from Warner Bros.
Official Synopsis: "The Director of Wanted presents this thrilling, crime-fighting action adventure. A student's life goes from zero to hero when he discovers the battered old car his father gave him can fly." I found this Russian film on Netflix about a college student, Dmitry Maykov (Grigori Dobrigin), who gets a Cold War era car that can fly and becomes a superhero. It follows a lot of the standard superhero stereotypes including an origin lifted from Spider-Man. Dmitry uses the car for his flower deliveries and, based on advice given to him by Prof. Viktor Kuptsov (Viktor Verzhbitsky), decides not to help anyone ever again. It's only after the stabbing death of his father (Sergei Garmash) that he realizes he can use the car for good and becomes a hero known as "Black Lightning." Kuptsov turns out to be a supervillain looking for the "nano-catalyzer" to power a massive drill that will release a layer of diamonds under the city, but destroy it in the process. Considering it was made on a budget of roughly $8 million, it looks really good and the CGI is comparable to a lot of Hollywood blockbusters. First time directors Alexandr Voitinsky and Dmitry Kiseilov make it fast-paced and exciting. The acting is respectable and has good production values. Don't forget to head over to alexjcavanaugh.blogspot.com to read the top ten movies adapted from books! Happy to host Nigel today! The Stargate reboot will be interesting. At least it's the same people doing the film. Wonder how often that has happened? Bill Murray as Batman - can't see it. And looking forward to the Man of Steel DVD. What's so great about that honest trailer is that it doesn't even mention the random kid who becomes Tony's inexplicable confidant throughout the movie. It's a fairly entertaining movie, but it's also like the Avengers version of Star Trek V: The Final Frontier. Great links! I can't wait for 11/23/13! Leigh has the funniest cartoons. I love the Dalek's reaction in the Peter Capaldi toon. I Know when I get the MOS Blu-Ray the poster is going to disappear, onto my sons wall. Also, awesome list at Mr. Cavanaugh 's site! Great post at the Ninja Captain's site! That SHIELD show sounds like Alphas that used to be on Syfy. Or maybe Alphas mixed with Fringe. The thing that annoyed me about Stargate was the Egyptian guys talked in subtitles the whole movie. I don't wanna do that much readin at the movies! At some point just make them talk in English. Superman on DVD, will be watching that one. Loved Stargate - including the TV shows, well done! Wow that is one informative blog post! Whew! Oh, and great post on Alex's blog! Jurassic World, sounds like fun! I cannot see Bill Murray as Batman and am not even sure if I'd want to watch the movie had he been cast in it. 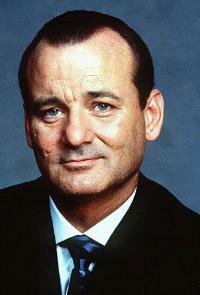 Although he's a good actor, I've tended to look at him as the funny man, after seeing "What About Bob." That sealed the deal for me, which could be a good thing or it could go the other way. I adored Stargate when it came out. Never could get into the shows, but the film has remained one of those ones that if I pass by on TV, I have to watch. That dvd art for Man of Steel is great looking, the film isn't the most popular release of the year, but I would add it to my collection. Whedon's Shield scripts are so bad he's having to do rewrites at the reading table? I have serious doubts about that one. I wouldn't be surprised that something wonky did happen and a rewrite was necessary, but for some reason, that just sounds really bizarre. I agree he would never have worked as a dark hero, but they were thinking about making it like the campy 60s sitcom. In that sense it might have worked. Bob is my second favorite Murray movie. I'm glad I could share a few bits of knowledge Yolanda! It does sound like Fringe or X- files Pat. A lot of people hate subtitles, but they don't bother me. They totally missed the kid Tony. That was one of the weak parts of the movie. It's like a do over Alex! I always think of him as a flawless writer, but somethings off Rusty. You got it Colin! Man of Steel is a must buy for me. I never got into the shows either Tim. They can never play it to much for me. I love the translation scene.